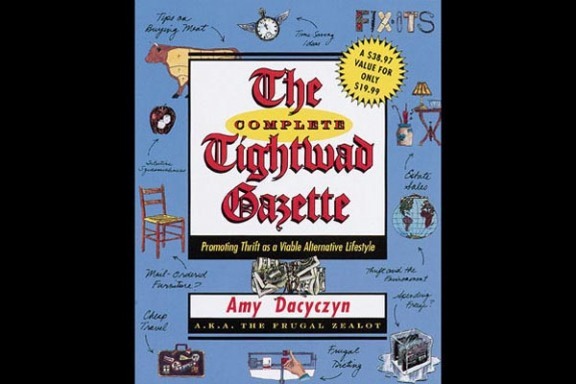 The Tightwad Gazette was a newsletter, published in the early 90’s, by Amy Dacyczyn. It was published in the days before email and the Internet. If you wanted to subscribe, you received your copies through the Postal Service. Eventually those newsletters were compiled into three books and, finally, into The Complete Tightwad Gazette which contains all three books plus some extra material. Over the years, The Gazette became the “bible” for the frugal movement. The author provided tips on everything from cooking to making your own envelopes. Some of her tips seemed pretty far out there while others were immediately practicable. The books are a bit dated now, especially since they were written before the advent of the Internet and all of the frugal resources that has created. However, I still haul my copy out once per year and give it a read through. It’s not because I have nothing better to do, but because I continue to find value in this great frugal resource. Here’s why I still read the Tightwad Gazette. My life changes every year. Tips that were once irrelevant (for example, gardening tips when living in an apartment) become relevant as circumstances change. Now that I have a house I can do more things like gardening that I couldn’t do years ago. As your life changes your frugal needs change, too. Every time I reread the Tightwad Gazette, it is with a new set of circumstances so I always find something that works now that didn’t before. The Complete Tightwad Gazette is a big book. No matter how many times I read it, I still find something that makes me say, “I don’t remember seeing that tip before.” The book is too big to take in on one read through. Multiple reads reveal all kinds of things you missed the first time (or second, third, etc.). Sometimes my frugality needs a lift. Maybe I’ve gone through an expensive period where I’ve had to replace the heat pump and the washer and I feel like I need to tighten my belt a bit. Sometimes I just need something to give me a new idea or direction. Maybe something that used to work isn’t working anymore and I need to know how to “step it up.” When I feel like my frugality needs a kick start, I pull out the Gazette and I’m sure to find something new to try. Even if the tip doesn’t pan out, it was probably still worth a try just to get me thinking in a different way. The Gazette is a great resource when you have a frugal problem or question. You can look up almost anything and find an idea. However, many of the Gazette’s ideas require some adaptation to make them work for your individual life. The author wrote about what worked for her, but sometimes it doesn’t work for everyone. I tend to find great solutions for some problems but I know they won’t work “out of the box.” I use the guide when I have a frugal problem and it’s great at setting me on the path to a solution. Sometimes, though, I just have to tweak her ideas a bit. I find that it’s not only the Tightwad Gazette that I benefit from rereading. Many personal finance books can be read more than once. As your life changes you find value in the sections you probably skipped the first time. For example, when I was younger I skipped or skimmed the sections on retirement planning and long term care insurance (it all seemed so far away) while I devoured the sections on buying a home and cutting the grocery bills. Now I read those retirement and insurance sections more closely since they are more applicable to my life (or will be sooner than I think). I recommend going back and rereading your favorites from time to time to see what else you can learn. If it was valuable to you the first time through, chances are you can find find something valuable when you reread it. Since the Tightwad Gazette is an older title it is readily available used. I got my copy at a library book sale for $1.00. You can probably find a similar deal or you may even know someone with a copy to loan you. Most libraries carry it, too. If you already have a copy but haven’t pulled it out in a while, I encourage you to peruse it again. You’ll probably find something you didn’t remember from the first read and you’ll likely be inspired to get back to your frugal roots. Good personal finance books are always worth rereading. I read my copy of Surviving without a Salary by Charles Long so many times the book about fell apart. It was one of the first I found in the frugal journey, which incidently I never voluntarily joined but has been a part of my life forever. I also reread the TG, and for many of the same reasons. Many of the tips are not directly usable here in the UK, but most have the germ of an idea that is. As you say, what was not relevant to me in the past is relevant now. The TG is also a funny read and it is truly inspirational. I also haul out my TG periodically just for the inspiration. Pretty soon, the thoughts of how to do some stuff a more frugal way or even “green” cross my mind. And it either gets me back on track or keeps me there. I agree that it’s inspirational. She demonstrates a cheerful mindset about “living cheap” or cutting back or deciding not to buy or spend that at one time I didn’t realize could be had. She was a model at a time I needed to cut back and not grouse about it. I read mine probably once a year all the way through. The proof that the book remains relevant is shown in the pages I unbend and bend anew as items jump out at me. I subscribed back in the 90’s for several years. I have fond memories of the newsletter and the information that helped me get through some financially challenging years. I have a couple of the books, too. Amy was great and way ahead of her time!! I also have that book and have found it very useful over the years. I gave one to a friend a long time ago and she has used it even more than I have! I can’t believe there’s someone else out there who reads this book annually and refers to it as the “bible.” I thought I was the only one! LOL. My ragged copies of “Gazette”, “Mother Earth New Almanac”, and “HowTo Live On Nothing” were my frugality library for many years. I’m waiting for savvy publishers to reissue them as e-books. I’m the kind of person who gets rid of old stuff — a minimalist of sorts. And yet I have all of the old newsletters still, as well as the books. I just can’t let them go. I, too read them about once a year. Thanks for the reminder of why I do that. It keeps me on track. i consider the complete tightwad gazette a bible too- many items don’t pertain to me – no kids for one thing- can apply to dogs though- the story about ice cream cones at the mall is one- it helps put so many things in perspective- some of the best concepts- number of wow’s per $, working to maintain things you don’t need or even really care about, net pay is huge. i keep mine handy and reread on a regular basis. I read this book all the time! It is applicable to life….it does reset your retail sense and puts you back on track. She needs to come out of retirement and write one for the internet age. Inspired by Amy D, every February, I have a “Buy Nothing” month. Yup, not even food. To help me stay on track and avoid feeling deprived, I re-read my big blue Complete TG, (purchased used, of course). I never fail to find something new or be reminded of an idea I’d forgotten about. Glad to know I have so many TG friends out there in the world. Somewhere in cyberspace there’s a recent-ish interview with her. Google it for a real treat. I reread the signed copy of TG Amy sent me to thank me for the idea I submitted. It never gets stale..
I’ve actually been re-reading TG the last couple of weeks in preparation for parenthood. Love the TG. Amy’s ideas have saved/earned me hundreds of thousands of dollars. But apart from that, Amy is a fabulous writer. I’d go as far as to say that The Complete TG is my favorite book. The best thing about the Tightwad Gazette was knowing that Amy and her family truly lived it. I discovered the first TG and immediately subscribed to the newsletter. Once I started receiving the newsletter I sent for all the issues I missed in between the book and my first newsletter only to receive my check back with a note that the second book would be out and contain those issues. My check was for $26 the book cost about $13. If ever I needed proof that they wanted to educate people and it wasn’t just about making money that little act was it. Found her interview from a few years ago on video. Had only read her books and had written interviews. She is wonderful and funny. Love her tips. Her home is well kept up with painting – she did a whole article on that. When studying how some people save money we do need to point out some advantages they have: her husband was in the military and that means a much less expensive health plan and a good retirement plan. The typical $500.00 per month taken out of non military work or even paying private insurance totaling near $1,000.00 per month is a budget strain. Then again, many military families struggle even with this perk.